Good: Gutters protect your home from water damage by collecting rainwater from your roof and channeling it away from your home’s foundation, driveway and porches. 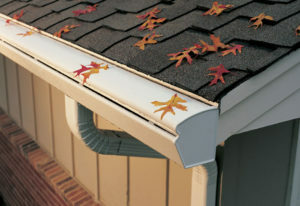 Bad: Traditional, open-top gutters also collect leaves and debris. This causes the gutters to clog, leading to ineffective water drainage and potentially severe damage to your home. 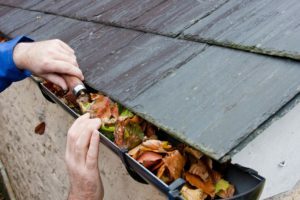 Ugly: Clogged gutters can cause widespread damage to your home’s foundation and roof, as well as water staining and even rotting fascia board. Without a leaf-free gutter system, you’ll have to continually risk climbing a ladder to keep your gutters clean. K-Guard Gutter Guards are a completely engineered, fully integrated, leaf-free gutter system. No other system can offer the strength, durability, capacity and attractiveness of K-Guard. Strength: The K-Guard system is built around our patented, high-strength hangers. Made from strong, all-weather polymers and set every 24 inches inside the gutter, these hangers fully support the hood and keep the gutter from sagging, or in any way losing its form. Durability: The lifespan of the K-Guard system is practically unlimited. Made of heavy-duty aluminum, the base material will not corrode. The coatings on the gutter and hood will last over 20 years, and the patented hangers give our gutters the strength to withstand virtually any weather conditions. Capacity: Because our gutters are a full 5-inches wide, our system is able to drain more water than other, smaller systems. And since our gutters accommodate the larger, 3×4-inch downspouts, K-Guard easily flushes out any small pieces of debris that may occasionally enter the system. Attractiveness: In contrast to the sharp corners and vertical faces of most gutter systems, the smooth, curved appearance of K-Guard gutters complements and adds beauty to your home. Ask your local dealer about the variety of colors available in your area. The experts of HGTV say you should always have gutter guards. Gutter guards are incredibly cost effective and useful. They eliminate the need for what can be a dangerous chore, while increasing property value. For these reasons it doesn’t make any sense to not have them. Gutter guards fall into 2 categories: gutter covers and gutter screens. Screens are usually made of wire mesh, nylon or foam. Gutter screens are simpler and cheaper to install, but usually don’t last as long. Gutter covers sit on top of your gutters, so their appearance is often more pleasing. Also, gutter covers limit the water flow into your gutters because… well… they cover the gutters. They can be made out of a variety of materials, including copper, aluminum, plastic, wire mesh, nylon and foam. Gutter guards are made to fit on top of your gutters with most gutter systems. With the K-Guard Gutter Guard system, the gutters themselves are completely replaced with 5 inch gutters and a custom helmet type cover is secured on top. What Gutter Guards Are The Best? We firmly stand behind our K-Guard Gutter Guard System. K-Guard Gutter Guards are the longest-lasting, most effective gutter guards in the U.S. with the highest level of customer satisfaction of any gutter guard manufacturer. Where To Buy Gutter Guards? The easiest way to buy K-Guard Gutter Guards is to use the K-Guard Dealer Network and find an authorized K-Guard Gutter Guard Dealer near you. Follow this link to locate a dealer and get started with your K-Guard Gutter Guards today. How Well Do Gutter Guards Work? While we can only speculate on the effectiveness of other gutter guard systems, we can promise you that the K-Guard Gutter Guard system works perfectly to keep your gutters clog-free, even in deep leaf conditions. How To Install Gutter Guards? You can install your own gutter guards, but generally any reputable gutter guard company will install them for you. The installation is included in the price of the gutter guards themselves. With a K-Guard gutter guard system, we insist that you let us handle the heavy work–it’s what we do and we have already taken care of all precautionary measures. Plus, with K-Guard, you’re not simply getting a lid to put on top of your gutters, you’re getting a full gutter system that works perfectly with our patented gutter hangers. How To Clean Gutter Guards? Some gutter guards do require seasonal cleaning to keep them in perfect working order and from getting clogged; however, K-Guard Gutter Guards are designed and patented to never need any cleaning inside the gutter. This is one of the many reason consumers choose K-Guard over the competition on a daily basis. We understand that not every roof is the same. We have designed K-Guard Gutter Guards to fit any roof and work the same with any type of roof from slate to metal to traditional shingle roofing. Are you a pro? Apply to be a dealer with K-Guard! Are you a homeowner? Find a pro near you who will get the job done right!